It’s been about six months since Plague Inc ($0.99) contracted Mad Cow Disease, so it seems like it’s about time to add another infectious disease to the game, don’t ya think? Developer Ndemic Creations thinks so too, and they’ve just announced the next big update for the humanity-eradicating strategy game. 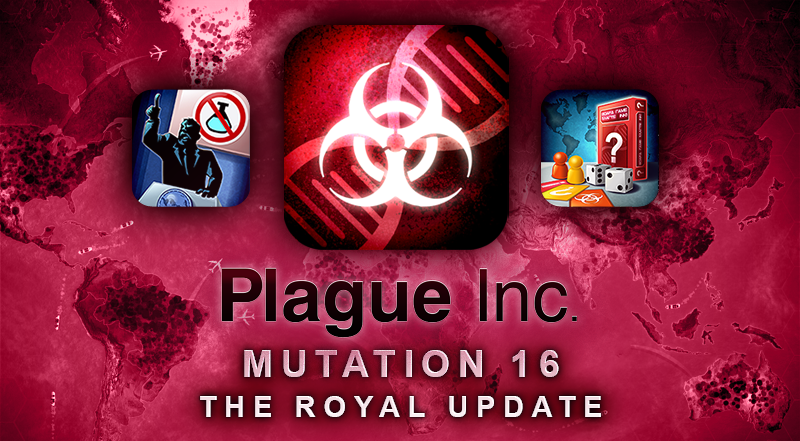 This one goes by the name Mutation 16 aka The Royal Update. No, it has nothing to do with a certain wedding that’s happening on Saturday, rather this is due to Plague Inc receiving a royal award from Her Majesty The Queen called The Queen’s Enterprise Award for Innovation. Hey, congrats! Virtually killing off all life on Earth is certainly innovative. Now, on to the actual content that will be in The Royal Update. The major focus of this update will be on two brand new Scenarios. The first is called the Ultimate Board Games scenario, and Ndemic describes is as such: “Make a best-selling board game in this radically different scenario that has nothing to do with disease! Investors have given you two years to design, produce and distribute your very own game. Can your cat-themed Scrabble/Risk hybrid outsell Monopoly?" Ok, that’s pretty darn clever. Are you up to the task of infecting all of humanity with… fun? The second new scenario is called the Science Denial scenario, and again Ndemic describes it: “People around the world have stopped believing in science, medicine and even diseases. One country decides to offer scientists sanctuary and from here they hope to save humanity from itself! Can you wipe them out in time?" Ok, that’s the dark and disturbing Plague Inc that I know and love. Finally, The Royal Update will include a completely redesigned interface that looks “816% better" according to Ndemic. This feels long overdue to me, as originally Plague Inc was a pretty simple game when it first hit more than six years ago, and steadily over the years more bits and pieces have been tacked onto it. It’s great from a consumer perspective as I’ve always said that Plague Inc is one of the best values for the amount of content you get in the entire App Store. But the UI and menu system could definitely use a refresh, so I’m looking forward to that. While no release date has been given, The Royal Update should be coming “soon" so keep an eye out for it.